January, 15, New York - According to Matushka Sophia McKenzie (Miami), Fr. Gregoire Legoute is alive. She spoke with him for a moment before the line dropped. "I only know that he was alive at the moment. He said things are bad and then we were cut off," she said in a telephone interview. Nothing is known about his family or Fr. 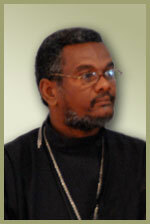 Jean Chenier-Dumais, the other ROCOR priest in Haiti. We ask you to continue to pray for the well-being of our suffering brethren in Haiti! The Fund for Assistance to ROCOR first began supporting the Haiti mission after a series of hurricanes devastated the island nation in 2008. According to matushka Sophia McKenzie, Fr. Gregoire had once called the hurricanes, which claimed the lives of thousands of people, "a blessing from God." "Oh yes, matushka, he said. They were a blessing. Because then the world paid attention, people helped us'. That made them move and collect money for them. But this is much worse," said matushka. Donations are coming in to FFA for the Haiti mission from concerned people all over the world. FFA will send it directly to the mission in Haiti. Please do not send clothes, food or medicine.